Lorraine Katherine Esworthy, age 98, formerly of New Market, died Sunday, October 14, 2018 at Citizens Care and Rehabilitation Center, Frederick. Born February 10, 1920 in Washington, D.C., she was the daughter of the late Elmer and Grace Beckert Isaac. She was the wife of Arthur Gillis Esworthy who died in 1995. Lorraine was a member of Locust Grove Church of the Brethren, where she formerly served as a deacon. She was employed with American Optical for more than 24 years. 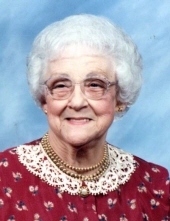 She enjoyed quilting, playing bingo and attending her church as well as services at Fairview Chapel. Surviving are a granddaughter, Shari of Australia; son-in-law, Ronald Grabill; sisters-in-law, Eleanor and Ora Isaac; and a number of nieces, nephews, cousins and friends. She was predeceased by a daughter, K. Ardene Grabill in 1993; sister, Dolores Thompson and brothers, Elmer and Joseph Isaac. A funeral service will be held at 11:00 a.m. Friday, October 19 at Locust Grove Church of the Brethren, with Rev. Greg Quintrell, her pastor, officiating. Interment will follow in Locust Grove Cemetery. The family will receive friends 6-8 p.m. Thursday, October 18 at Hartzler Funeral Home-Libertytown, 11802 Liberty Rd., Frederick, and on Friday at the church from 10:00 a.m. until time of service. Memorial contributions may be made to Locust Grove Church of the Brethren, 13356 Glissans Mill Rd., Mt. Airy, MD 21771. To send flowers or a remembrance gift to the family of Lorraine Katherine Esworthy, please visit our Tribute Store. "Email Address" would like to share the life celebration of Lorraine Katherine Esworthy. Click on the "link" to go to share a favorite memory or leave a condolence message for the family.